Desiré Wilson became the only woman to win a Formula One race of any kind when she won at Brands Hatch in the British Aurora F1 championship on 7 April 1980. As a result of this achievement, she has a grandstand at Brands Hatch named after her. Lombardi: first and only woman to score points. The involvement of women in Formula One was pioneered by Italian Maria Teresa de Filippis who entered five races in the 1958 and 1959 seasons and started three scoring a best result of tenth position in the 1958 Belgian Grand Prix. In the following race in France, the race director denied her involvement, saying that "the only helmet that a woman should use is the hairdresser". Maria ended her career at the Monaco Grand Prix the following year. After fifteen years without any women in the category, another Italian, Lella Lombardi, competed in three seasons, from 1974 to 1976. She entered seventeen races and started twelve having her best result in the 1975 Spanish Grand Prix where Lombardi finished in sixth. With the race being stopped before three quarters of the scheduled race distance was completed, only half points were awarded. Lella became the first and so far only woman to score points in the World Championship. In 1976 the Briton Divina Galica tried to qualify for the British Grand Prix. This was the only Formula One Grand Prix in which multiple female racers (Lombardi and Galica) were entered, but both failed to qualify. In 1980, the South African Desiré Wilson tried to qualify for the British Grand Prix, not succeeding. In the same year she became the only woman to win a Formula One race of any kind when she won at Brands Hatch in the British Aurora F1 championship on 7 April 1980. As a result of this achievement, Wilson has a grandstand at Brands Hatch named after her. The last woman to try to compete in a Formula One Grand Prix was Italian Giovanna Amati in 1992. She tried to qualify for three races, but failed in all attempts. She was replaced by Damon Hill, who also failed to qualify the car in the 6 out of 8 following races he entered that season. Drivers listed in this table are those who have entered a Grand Prix. Actual starts are stated in brackets. Some female drivers have participated in non-competition testing and evaluation sessions with Formula One teams. IndyCar driver Sarah Fisher performed a demonstration run with McLaren after first practice for the 2002 United States Grand Prix. Katherine Legge tested with Minardi at the Vallelunga Circuit in 2005. Other female drivers have been contracted to Formula One teams in testing and development capacities. In 2012, Williams signed Susie Wolff as a development and test driver, and María de Villota was a test driver for Marussia until her crash in 2012 and death the following year. In 2014, Sauber signed IndyCar Series driver Simona de Silvestro as an "affiliated driver", with the goal of having her compete in 2015. In 2015 Lotus F1 signed Carmen Jordá to a deal including a run in a car. 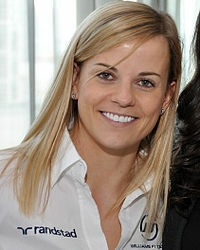 In 2014, Susie Wolff was the first woman to take part in a Formula One race weekend in 22 years, when she participated in the first practice session at the British Grand Prix at Silverstone; the previous time being in 1992, when Giovanna Amati made three unsuccessful Grand Prix qualification attempts. Sauber signed Colombian driver Tatiana Calderón as development driver for 2017. Calderón was promoted from her development driver role to test driver for the 2018 season, and tested an F1 car for the first time with Sauber in Mexico in October 2018. ^ a b Diepraam, Mattijs (October 1998). "F1's only female winner". FORIX 8W. Autosport.com. Retrieved 21 January 2012. ^ a b "F1: Primeira mulher a pilotar um Formula 1 é "estrela" em Portimão". Autoportal. 12 October 2010. Retrieved 27 July 2015. ^ "Escocesa é a primeira mulher a participar de treino oficial da F1 em 22 anos". UOL. 4 July 2014. Retrieved 27 July 2015. ^ "Maria Teresa de Filippis races in Portuguese Grand Prix - Aug 24, 1958". HISTORY.com. Retrieved 27 July 2015. ^ "TOP CINQ: Cinco Penélopes Charmosas". Bandeira Verde. 19 August 2011. Retrieved 27 July 2015. ^ "Maria Teresa De Filippis - Sport - The Observer". The Observer. 5 March 2006. Retrieved 27 July 2015. ^ "Espanhola é esperança de presença feminina na F1 após 20 anos - F1 - iG". IG. 23 August 2011. Retrieved 27 July 2015. ^ a b "Que fim levou? - Lella Lombardi". UOL. Retrieved 27 July 2015. ^ "Lombardi feat was mere footnote to tragic 1975 race". Reuters. 5 May 2015. Retrieved 27 July 2015. ^ a b "Coluna La Rascasse: As mulheres e a Fórmula 1". F1Mania. 11 May 2012. Retrieved 27 July 2015. ^ "Women in Formula One". formula1-dictionary.net. Retrieved 27 July 2015. ^ "Women in F1: still a distant dream? - IOL Motoring F1 Grand Prix". IOL. 7 May 2015. Retrieved 27 July 2015. ^ "Desire Wilson: The story of F1's only race-winning woman - F1 Fanatic". F1 Fanatic. 26 February 2014. Retrieved 27 July 2015. ^ "Lika In-Loko: Mulheres na F1 - um resgate feminino". F1Mania. 19 August 2009. Retrieved 27 July 2015. ^ "Lembra se de...Giovanna Amati?". Autosport.pt. 8 September 2008. Retrieved 27 July 2015. ^ "Giovanna Amati - F1 Driver Profile - ESPN.co.uk". ESPN.co.uk. Retrieved 27 July 2015. ^ "Sarah Fisher to drive McLaren". Autosport. Haymarket Publications. 19 September 2002. Retrieved 16 March 2014. ^ "Katherine Legge makes Minardi debut". F1.com. 23 November 2005. Retrieved 16 March 2014. ^ Elizalde, Pablo (11 April 2012). "Susie Wolff joins Williams as development driver". Autosport. Haymarket Publications. Retrieved 13 April 2012. ^ Noble, Jonathan (15 July 2013). "Wolff, Juncadella join Williams for young driver test at Silverstone". Autosport. Haymarket Publications. Retrieved 4 August 2013. ^ "Maria de Villota joins Marussia F1 team as test driver for the 2012 season". Autosport. 7 March 2012. Retrieved 13 April 2012. ^ Associated Press (11 October 2013). "Former Formula One test driver Maria de Villota dies". USA Today. Retrieved 12 October 2013. ^ Press Association (14 February 2014). "Sauber hire IndyCar driver Simona de Silvestro to prepare her for F1". The Guardian. Retrieved 15 February 2014. ^ Autosport (26 February 2014). "F1: Lotus signs Jorda to development role". Racer. Retrieved 26 February 2014. ^ "British Grand Prix 2014: Susie Wolff the first woman to take part in a Formula One race weekend in 22 years". Independent. 4 July 2014. ^ Benson, Andrew (February 28, 2017). "Tatiana Calderon: Sauber sign Colombian as development driver for 2017". BBC Sport. Retrieved March 2, 2017. ^ Klein, Jamie (6 March 2018). "Tatiana Calderon gets expanded Sauber Formula 1 team role". Autosport.com. Autosport Media UK. Retrieved 6 March 2018. ^ Smith, Luke (31 October 2018). "Tatiana Calderon hails 'incredible experience' after maiden F1 test". Crash.net. Retrieved 6 November 2018.